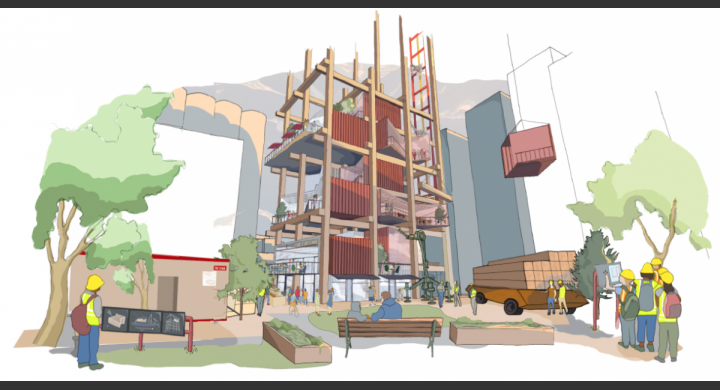 Sidewalk Labs, a subsidiary of Google’s parent company Alphabet Inc. is looking to transform Toronto’s waterfront into something straight out of a science fiction novel. Micro-units, taxi bots and modular buildings are just some of the innovations coming to Toronto. After winning a competition organized by Waterfront Toronto, Sidewalk Labs was granted rights to develop Quayside, a 12 acre site in Toronto’s East Bayfront Neighbourhood, with the stated goal of scaling up across Toronto’s Portlands, an 800 acre area. The first project by Google’s Sidewalk Labs, Sidewalk Toronto is expected to become a testbed for emerging technologies, material and processes. In Today’s post, we will cover three of these proposed innovations and their implications on Toronto’s real-estate scene. When Uber launched in Toronto in 2014 it caused a massive uproar and disruption among Toronto’s taxi drivers, who worked within a government run licensing-monopoly where only a set number of taxi-plates are issued per year. Prices for these government issued plates reached a high of $360,000 in 2012. Since Uber has come along, prices for taxi plates have reached sub $100,000 levels, and today can be found as low as $90,000 on websites such as Craigslist and Kijiji. And if that major game changer wasn’t enough, Sidewalk Labs is bringing another potentially disruptive idea to Toronto’s waterfront: Self-driving taxi bots. Users can chose to ‘ride alone’ or pick bots with roof-racks for their bikes, among other possibilities. 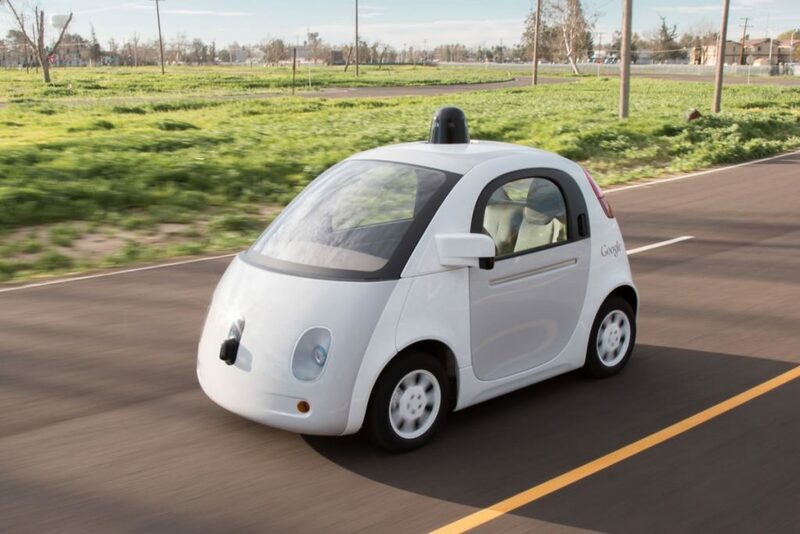 High traffic zones will be served by multi-passenger vehicles called ‘van-bots’ . These innovations are expected to reduce traffic and provide a quicker, more efficient user experience. They will also reduce the need for parking spots in condos and around the neighborhood, allowing for more purpose built spaces that reflect then needs of the community. As the cost of living continues to increase in the Greater Toronto Area, an increasing number of first time home buyers are priced out of owning a home. With the rise in rentals, there is a real demand for low cost affordable housing that is easy to scale. Sidewalk Toronto looks to bring affordable homes built using pre-fabricated parts, made from a base set of modules that can be configured into different unit and building sizes, shapes and colours. As home prices continue to increase, and mortgages become less accessible, some Torontonians are finding themselves being priced out of even the smallest downtown condos. 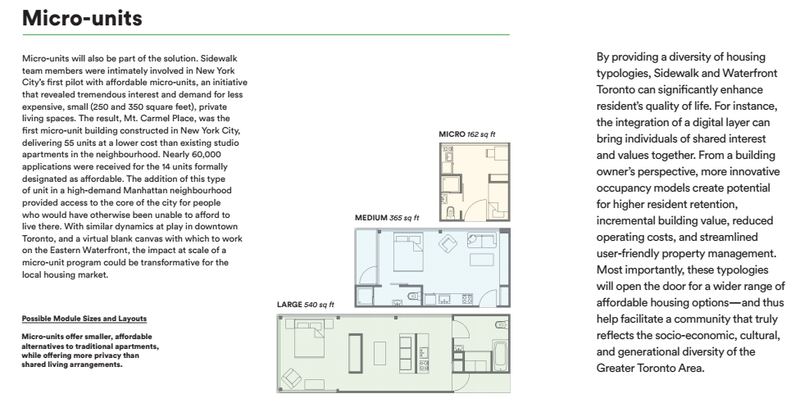 Sidewalk Labs looks to bring the concept of the micro units – some as small as 162 sq ft – as an aid to Toronto’s increasingly expensive real-estate. When micro-units were piloted in New York City, over 60,00 applications were field for the affordable units. For the first time, people who could never live in the downtown New York City core, now owned a micro-sized unit right in the heart of downtown Manhattan.